Windows 8.1 features automatic scaling based on the physical dimensions your display. However, in a virtual machine it is typical for device not to report any EDID information at all. This results in the automatic scaling producing tiny ~96dpi results, even when 200% scaling is turned on for traditional Windows content. Indeed, setting the 'Larger' option for metro still suffers from being too small relative to other content. Luckily, it is still possible to provide Windows with an EDID override in the registry. The EDID information of any Retina Class display will work just fine. 3. Open edid.dat in MonInfo (File -> Open). This will display summary information about the device. Win-C to bring up Charms Bar. 6. 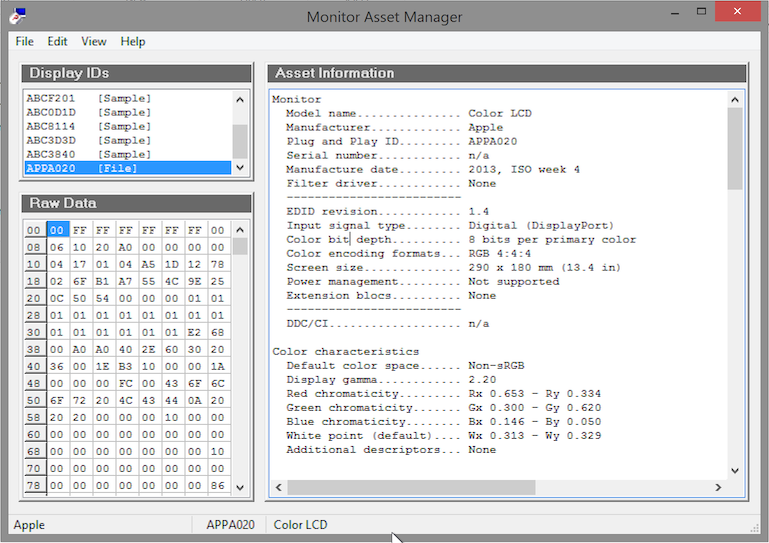 Change from 'non-pnp monitor' to monitor.inf edid override. Please enjoy Modern UI scaled correctly for a retina display! P.S. Hey VMWare why not include EDID info in your virtual display drivers? Take a stand, fight back against the tedium of the above instructions! © David Connolly, 2010. Awesome Inc. theme. Powered by Blogger.